The South American country already tried land expropriation, nationalisation and cadre deployment years ago, and has only ruination to show for it, says the DA. DA leader Mmusi Maimane on Friday shared a platform with Venezuelan opposition members in South Africa who are trying to raise awareness about the dire state of their country. 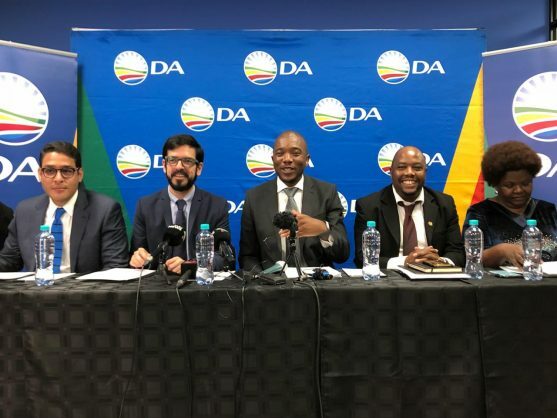 Primero Justicia’s (Justice First’s MPs Miguel Pizarro and Jose Manuel Olivares, both members of the Venezuelan Parliament, were in Johannesburg to publicise what Maimane described as the devastating social, political, and economic crisis unfolding in their country. “Miguel and Jose reached out to the Democratic Alliance (DA) as they recognise our party as a defender of liberal democracy, and a champion of the advancement of freedom and human rights,” said Maimane. Maimane said Olivares was working on securing humanitarian aid to counteract the shortage of medicines in Venezuela, but had been exiled Colombia after his family received threats unless he quit politics. Maimane said Primero Justicia was, much like the DA, a centrist, liberal party with a large diversity of supporters bound together by shared values, and a commitment to the basic tenets of liberal democracy: a market economy that values enterprise, the rule of law, individual rights guaranteed by a constitution that limits and checks power, private property and free speech. “This is the best way to defeat poverty and maximise the true freedom of all citizens,” said Maimane. Primero Justicia is the main opposition party in Venezuela. They hold 33 seats of the National Assembly’s 167. He said that hearing first-hand account of the dire situation in Venezuela was important for South Africans, so they could hear the real story of the situation in Venezuela, “as there are some in our country – including in the ANC – who venerate and celebrate what has happened in Venezuela as a model of ‘radical transformation’. He said Venezuela had already enforced three interrelated policies that had inflicted huge damage to the country: Expropriation of land without compensation, the nationalisation of banks, mines and other industries, and institutionalised corruption through nepotism and cadre deployment. “Venezuela’s collapse began with the election of Hugo Chávez as President in 1998, a radical populist who preached state control and ownership of the country and its resources as the answer. A year later, in 1999, the Constitution was amended to declare that ‘the predominance of large idle estates (latifundios) was contrary to the interests of society’. In other words, similar to the direction the ANC government is headed, the Venezuelan constitution was changed to allow the government to expropriate land without compensation. “In practice, however, it was not only ‘idle’ land that was taken. The government implicitly encouraged land invasions, which often reduced productivity to the point where farms became ‘idle’ enough to qualify for expropriation. Land was also allocated according to political criteria, with those who supported the government first in line to receive land. "We need to get back to a path where economic growth is put in the hands of SAns so that private property rights can be protected. “In 2003, the government escalated its assault on the economy by introducing price controls. Over the coming years, rapid economic decline followed. Agricultural production dropped sharply between 2007 and 2011: maize by 40%, rice by 39%, sorghum by 83%, sugar cane by 37%, coffee by 47%, potatoes by 64%, tomatoes by 34%, and onions by 25%. “Large quantities of fertile land fell out of production, while food imports continued to rise. This led to people having to queue for five to six hours a day in the hope of buying food and other much-needed items. “Rather than admit these policies were a failure, and start over, in 2014 the government tightened the price controls further. Both farmers and food producers were forced to sell at prices below production costs, which cut supply even further. The manipulation of the economy by the government resulted in investment flight, and between 2013 and 2017, Venezuela’s economy contracted by 39%. “The very people the populists claimed to care for are the ones suffering the most. Extreme poverty grew from 24% of the population in 2014 to 61% in 2017. The infant mortality rate increased a hundredfold during the period of 2012 to 2015, and is now higher than in war-torn Syria. The minimum wage has actually fallen by 75%. Inflation has reached 1 million percent. “Today, Venezuela is a humanitarian tragedy, and it is only getting worse. The country has all but been destroyed – 80% of the population lives in poverty, and three-quarters of the population are under-nourished or hungry. The inability to import sufficient food and medicine means the crisis is fast spiralling. Maimane challenged President Cyril Ramaphosa to use South Africa’s position on the UN Security Council to try to resolve the crisis in Venezuela and return the country to open democracy. "The shortest way to describe #Venezuela is a failed state. There are 3 policies we share in common, the first is the expropriation of land without compensation. He said Venezuela’s story was a warning of the dangers of radical populism in South Africa. “We must not be arrogant enough to think that it cannot be related here, when many of the same social and political signs that existed in Venezuela in 1999 also exist in South Africa today. We must see the signs and call them out: the divisive language, pitting South Africans against each other, the dangerous violent language, the incitement, the talk of genocide, the use of race to provide cover for the abuse of power, and the destructive socialist policies which only guarantee more poverty and suffering. We must see these things clearly for what they are, and stop them now. He said it was “the deadly concoction of land expropriation, nationalisation, centralisation of power, corruption and populism that leads to collapse”. He said the DA and the Venezualans had signed pledge to work together in advancing freedom and democracy.